It seems that the past and the future are meeting each other in the current time we are living in. Right now, it’s possible to see noble and excellent bands from the past living and playing side by side with beginners. 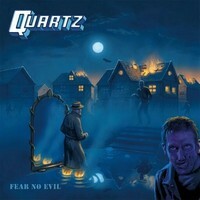 Another great name from the past that is back: the English quintet QUARTZ has returned to activity, and after the compilation “Too Hot to Handle”, they come with a new album, “Fear No Evil”. These guys come from Birmingham, so the lightning stroke those lands three times!!!! They started their musical career back in 1977, so they are part of the NWOBHM movement as well. But they are savage and really heavy, showing great influences from the 70s, especially from BLACK SABBATH in a more personalized way (maybe the presence of Geoff Nicholls has something to do with this aspect. But as well, they have fine melodies guiding their songs. So be prepared, because they came to get you! Clear in the right level, but sounding heavy and organic as well, the album’s sound quality was done in a way that their songs sound alive and really heavy, and not something outdated. No, it’s truly good and energetic, with good tunes on each musical instrument. Hearing “Fear No Evil”, you’ll understand why Big Daddy here always says to spare clones from the original ones: these guys unleash a wild form of energy from their songs, something that is their own. Best moments: the melodic tempos of “Fear No Evil” (showing excellent guitar riffs and great chorus), the power of the catchy Heavy Rock called “Rock Bottom” (great work from bass guitar and drums), the bitter weight of the slow song called “Zombie Resurrection” (showing a rawer insight of their melodies), the climatic and somber “Walking on Holy Water” (where BLACK SABBATH influence is clear on the guitar riffs and on the tempos), the catchy song called “Dangerous Game” (another song filled with a classic Hard Rock orientation, but with very good amounts of musical weight), the grasping heavy insight of “Born to Rock the Nation” (very good vocals, indeed), and the excellent keyboard parts shown on “Riot in the City”. Welcome back, QUARTZ, and I wish you all the success you deserve!